Online visits are a fundamental aspect of the remote neurorehabilitation system for post stroke recovery created by Dr. Valerio Sarmati. For these online visits, we use Skype, which is currently the best video calling system available worldwide. In fact, most of us are already familiar with this tool, and our philosophy is to always focus upon simplicity and practicality. We always provide for an Online meeting with our specialists, together with the purchase of the video guide. This allows us to meet the family member and the patient directly, and gives us the opportunity to observe any difficulties the patient may have with walking, gripping objects, and speaking. This also allows us to immediately indicate the work that needs to be performed at home. In fact, at the end of the online meeting, which typically lasts about an hour, we issue a rehabilitation folder containing all the instructions and practical videos necessary to follow the program outlined during the visit. The Video Guide itself is structured in such a way that that families can even follow the instructions independently, while at the same time immediately receiving the clear and precise instructions of a rehabilitation professional, which will allow them to tackle the job more safely and effectively. There’s also a certain emotional and psychological aspect to be taken into account, which gives even greater value to the online visits. In order to understand this aspect, we must place ourselves in the shoes of the patient, who must rely upon their family member despite knowing that he/she is not a rehabilitation professional. The online visits are also intended to reassure the patient with the presence of a rehabilitation professional, who can guide the family member’s work in a controlled and decisive manner, without leaving anything to chance. 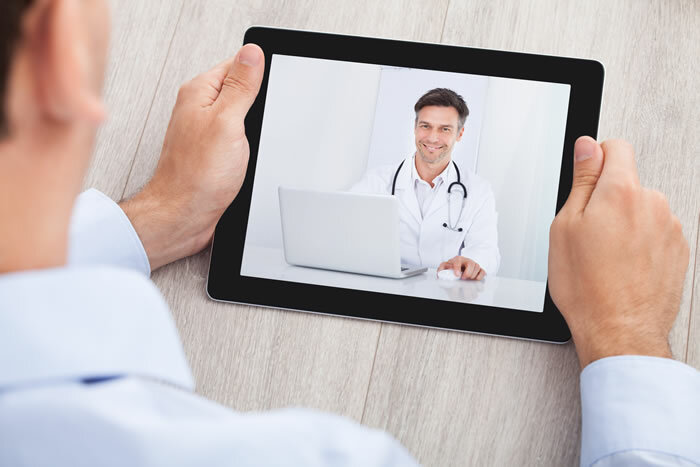 From a technical standpoint, in order to enjoy an online visit with the specialists from Dr. Sarmati’s Stroke Therapy (R)evolution Ltd., all you need is an internet connection and a smartphone, tablet, or personal computer (PC or Mac). During the online visit itself, if the patient is able to walk or simply take a few steps (even with the help of a cane and a family member), we will need to see them do so. All it takes is a few steps for us to get a clear idea of the difficulties faced by the patient when walking, and it is therefore not necessary to have any particular amount of space available for the video call. It just has to be at the house where your normally reside, because this is where the rehabilitation will be performed. Family members frequently purchase the Video Guide during the first few hours following the stroke suffered by their loved one in order to be immediately prepared and participate in their recovery. This rapid decision making allows the family to quickly and properly prepare for the choices that will need to be made during the following months, and performing the neurocognitive rehabilitation exercises immediately with their loved one offers them the chance to enhance their loved one’s recovery, even while they’re still at the hospital or rehabilitation clinic. Under these circumstances, when the first online visit needs to be performed with the patient still at the hospital, there are various situations that need to be evaluated, such as tight time frames between the administration of medications, meals, visits, exams, and other activities that do not always allow for an hour of free time for an Online Visit. Furthermore, there’s also the question of potential connection problems, in the sense that we cannot always be certain of having the necessary WI-FI coverage to sustain a video call, like we can at home. In these cases we suggest only conducting the online meeting with the family member who will be handling the rehabilitation, without necessarily meet with the patient as well. The familiar member’s stories and explanations will still allow us to come up with an initial work program, for which the first exercises can even be performed at the hospital. We will also ask the family member to send us a few short videos showing some of the patient’s skills, which will help us to confirm the therapeutic choices, or to make any necessary changes. In this regard, the Facebook Support Group, where all our patients upload videos of the exercises performed at home, once again plays a fundamental role in our remote neurorehabilitation model. This closed group is open to all the patients and family members that we follow with the home rehabilitation program, and allows users to easily and intuitively post videos of the patients, which in turn will help us keep up-to-date on our care, as well as the patient’s progress. The idea of establishing a support program gave an incredible boost to the remote neurorehabilitation program. This support package guarantees exceptional continuous support for the family. In fact, it includes 2 monthly online meetings, as well as ongoing help with correcting the exercises performed at home and posted on the Facebook Support Group’s page. In just a few months’ time, patients who follow the support program tend to become extremely good at performing the exercises, and become increasingly autonomous in making their own therapeutic decisions and choices. In fact, these patients typically achieve greater success, and are more commonly featured on our wall of heroes.